Which brings me to Bone Ink, the debut collection, from Australian poet Rico Craig. I bought this book when I was in Sydney earlier this year, and had the good fortune to connect with Rico a few days later. I have often read the work of writers I have come to know online, but this is a rare instance in which I am writing about the work of someone I have actually met in person. So I allowed myself a little space before giving this collection a proper read. And my response is simply: Wow! ice, rock salt strewn on our streets of Sternschnaze. shocked, seeking salvation in a slab of brie. the taste of places bright enough to burn sand into glass. Upon finishing this book, I returned to an interview conducted by my friend and fellow blogger, Tony Messenger, at the time of the release of Bone Ink. It was no surprise to see Craig explain that he “started as a prose writer trying to write ridiculously long and complex stories, it didn’t go well, but I kept trying, maybe for too long. I finally clicked with poetry as a form when I understood that it gave me a way to tell a fragment from a longer story, but tell it in a way that was satisfyingly rich.” I had forgotten this comment, but it resonated with and reinforced my own reading. The second part, “The Upper Room,” is more abstract, featuring primal, vivid imagery drawn from art and nature, and woven into stories and urbanized folktales. There is a more mature allegorical quality to these pieces. This section opens with “With Chris Ofili in The Upper Room,” a magical visit to an exhibit of the British painter’s artwork that turns surreal when monkeys slide off their canvases and lead the narrator on an escapade across the city. It closes with the wonderful six-part “Lampedo,” a sequence of taut poems that forge a febrile romance between a contemporary urban dweller and his mythical Amazonian queen. This collection, in the span of less than sixty pages, offers a finely tuned series of condensed narratives—indelible portrayals of passion, heartache, and loss that linger in the imagination. Rico Craig’s Bone Ink is a poetic testament to the instinctual urgency of being alive. The publisher of Bone Ink has gone out of business. For more information about Rico and this book, see his website. Sure. This is a great book. There will be more Australians down the road too. An *anecdote*? Do you mean antidote? Those are very evocative pieces you’ve share here, Joe – thanks! What an interesting question and resolution: why not apply it to reviewing poetry, indeed. I enjoyed reading through your process and appreciate the idea of selecting one’s reading in order to support one’s writing. “Poetry opens knots in my prose.” Now that you’ve taken the plunge, do you think you’ll ve reviewing more poetry as you read more? I hope to review more, especially work by contemporary/new poets. I have quite a few shorter collections on hand—the type of things I would read as stand-alone works (as opposed to larger “complete” or “selected” works that i tend to read in and out of). I have reviewed occasional poetry collections before, but I’d like to have it become more of a regular practice now. Reblogged this on Rico Craig. Thanks so much for reviewing Bone Ink! Thank you for this! I follow Rico Craig and his work on WordPress and Twitter. Follow and fade. Follow and fade with my attention to the social media. My jaw always drops with the visual power of his writing and then I carry on. There’s something about his work that slices between bone and meat and slips directly to my core. But (!) not until reading your brief review did I realize that I have to have Bone Ink in my hands. Thanks Roughghosts. Most welcome. Twitter and other social media has drawbacks for certain, but it can connect writers and readers who would never otherwise meet. 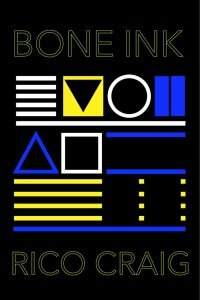 I’m certain you won’t be disappointed by Bone Ink!